has anyone noticed during the baseball scene when Rosalie slides into the base the line of the song is "She's the queen of the superficial". I just noticed that and I almost died laughing. Pvt. Elizah Loveless of Jasper's Confederate Army - Stainless Claret! Wrecking Ball Operator @ EDC, Inc.
mgrassel06 wrote: Jasper saying "Oh I think we can handle that." That was like the first time he actually spoke up. The first time I heard it, I thought I detected the slightest trace of a Southern accent. Was that just me? His voice was great whatever it was, though. I also thought it was really cute when Bella was in Edward's room and she asked "What are you listening to?" and turned on his stereo and Edward kinda mumbles "Debussy... I don't know" and he shrugs and does this little shy smile. Yum. "Yes, no, to get to the other side, 1.772..."
"I don't want to know the square route of pi." And then when Edward first walks into the cafeteria with his family, and he laughs cause he hears Jessica's thoughts. And then he stars at her. EEppp. But is Emmett really holding a bag of eggs? And does it really look like Edward flicks Emmett off during the baseball scene? I am so going to watch for that now. Holy crow i love that part in the resteraunt i had completely forgot about it. I have a question of my own: does edward take bella's pants off during the kiss scene? Both are so hot, why should I have to decide? no, she already had them off.. you could tell on the wide angle shot before they zoomed it in. it's on one of the trailers. I have seen it 4 times now and it is becoming hard to pick one favotite scene.the first time i saw it the kiss scene and the base ball scene were the best.The second time in the woods/medow where the truth is reveled,the prom,the kiss,the baseball.The 3rd and 4th time,every scene!I LOVE THIS MOVIE! --the meadow -- the colours, the setting...it was perfect. The acting was very good there. I liked that they included the lines "I am the world's best predator, aren't I? Everthing about me invites you in..." "AS IF you could outrun me...AS IF you could fight me off" although the scene was very brief, it was perfect. --the port angles scene - ahh, Edward's interance with his car in the parking lot was amazing. and then he just gets out and is like "GET IN" and he had this hot but dangerous look. Wow, robert is right. it's hard to be dangerous and look pretty at the same time. but he did it perfectly. 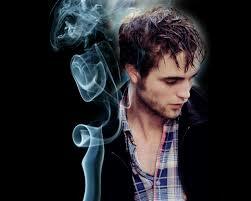 --telling charlie she has a date with edward cullen -- "YEAH, bring him in" *puts gun into place* definte favourite. and i think that's it as far as i can remember. i'll be watching the movie again tomorrow. I'll add to this list. Maybe it was just me, but I loved when Mike shook the rain off of his hat onto Bella, and said, "How you likin' the rain, girl?" Just the way he said it had me almost die laughing. Bulldozer Operator @ EDC, Inc. Owner and Operator of Calming Coves Bed & Breakfast - Jasper says Relax!